Creativity and Innovation go hand in hand, and with the advent of incredible technologies in smartphones, everyone is pushing them more forward. Many new Startups, companies, and budding agencies struggle hard to keep them up with all the competition in the market. The one thing that every online business requires is an application for smartphones. Though many companies hire developers for the job, application development is not something you can manage in low prices. But as they say, there’s a solution to everything and there is one such online app builder or CMS that allows you to create your own Android or iOS application, and that too for free. So without any more blabbering, let’s start the review of a wonderful web-platform AppSpotr. Cheers! According to research, almost 82% of the users nowadays use their smartphones to surf the internet or any other task. That’s why every company, no matter how small needs an application for their product or a website. Mobile Applications makes your product or brand known to the brand and also brings potential customers. All in All, it is a must need for any business or company who wants a surging growth. 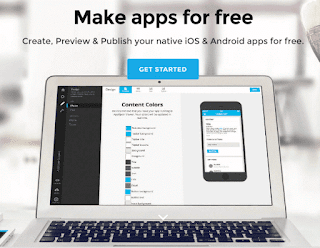 AppSpotr is an online application builder for both Android or iOS powered devices. The platform provides a full-fledged incubator for developing an application with native features and without any coding. You can make an app for your website, video-based app or simply a primary application with numerous modules. Moreover, you can quickly publish the app in App Stores as well. All the premium features obviously come with a paid subscription, but the company offers a super cheap deal which would costs you a dime. I’ll mention the pricing later in the review, but let’s jump to the setup process. 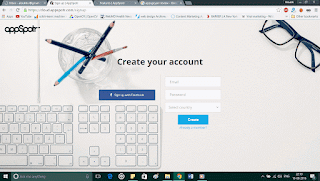 To begin with the development process, all you need is to create an account on the website and you’ll be directed to the dashboard where you can start the designing stuff from scratch. It’s absolutely free for the basic elements and features, but for the premium module, you’ll need to purchase the monthly subscription. Frankly Speaking, it has the simplest and an intuitive interface for the users. You can start directly by choosing the desired template from the respective business category. Moreover, if you’re not satisfied with all the design, you create your own from the scratch. It would be fully customizable and has options to add numerous features or modules. Fill up the name and you’re all set to go. The dashboard comes up with all the necessary tweaks and customization for the homepage and every other page in the application. You can also add images, animations, geo-location, lists, events, maps, QR code, and much more. There are options to add numerous texts with font kits, notifications, design layout and various other modules which will really give to the relative feeling of a beautifully crafted native app. Now, talking about the offerings, AppSpotr packs a broad range of free and premium features that you can add in your apps. So, let’s take a glimpse of all the features offered by the online app-builder, AppSpotr. Most of the online builders only allow you to create apps for Android eco-system only. Apps built would be backed by both, Android devices and iOS devices like iPhone, iPad, etc. Also, the developer company offers cloud support to save up all of your apps in development. With so many numerous modularity features, you can easily edit and design the application too. 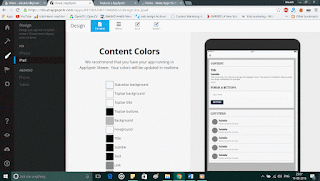 The company offers a Powerful App design system. 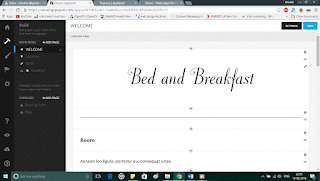 Create and add custom images, texts, and icons as well. You can add your own logo of the respective brand as well. Add modules like content, topics, news, gallery and much more for both free and paid offers. So, how much do this remarkable tool costs? Well, it is the cheapest deal you could find right now. Although most of the features are free for the users, you could upgrade your subscription for more premium features. The pricing is placed for only $5/ month. You can read more about the feature on the official website. None. Though the company could improve the features and listings. So, this was my take on AppSpotr, the Online App Builder, and now it is your time to tell me about what you think of this wonderful service. The dashboard has a very minimal and straightforward interface. You can easily create, tweak and publish your applications.